Cookies without the gluten? Absolutely? Do they taste good? They taste GREAT ! The secret is almond flour. It is a wonderful baking ingredient that takes gluten-free from so-so to superb! Add some dark chocolate cocoa powder and a slew of peanut butter chips and you have one rockin' cookie. 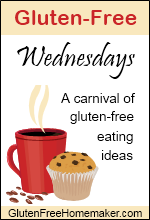 My son follows a gluten-free diet and I am always looking for new baking ideas. I love baking cupcakes - they are my specialty - but cookies are fun, easy and a wonderful way to spice up school lunches. If peanuts are a no-no at your school the just replace the peanut butter chips for chocolate chips or butterscotch chips and you are in business. I highly recommend you use a parchment lined baking sheet when baking these cookies. They slide off , don't stick and clean-up is a breeze. Use top quality almond flour. Though Bob Red Mill's products are lovely, I find their almond flour too grainy. So try some other brands and see which one works for you. I have always used the JK Gourmet brand. I used my KitchenAid stand mixer for this recipe but a bowl and whisk would work just as well. Just ensure the ingredients are blended well and no almond flour lumps can be seen. So are you ready? Let's get to it ! These sound yummy! I'm intrigued by the almond flour - I really want to give it a try sometime. I host a linky party (Crazy Sweet Tuesdays) and hope you can join sometime! These cookies look so good! I tried to look for almond flour in my store the other day but had no luck. Gonna try a health food store next! I've never seen JF Gourmet brand here in the Pacific Northwest, but I'm sure I can find a substitute. These look yummy! Is the cinnamon essential to this recipe? ie...can you taste it? These look DIVINE, will make this weekend!! Hi just found your blog I like the way you cook, my son loves anything with peanut butter in it, I will have to try these out and your muffins from you last post. I enjoyed looking at your back posts. Lovely to meet you greenthumb and happy you found me !! Thanks for sharing on Crazy Sweet Tuesday! :) I can't wait to give these a try.